Uglyworld #741 - The Welcome Cookie (235-365), originally uploaded by www.bazpics.com. After the madness which ensued earlier in the week when Trunko happened upon a strange green goblin in the garden Babo had been out searching for the little guy ever since. Finally he returned to the hotel room this evening with his new found friend, "Everyone, this is Gordon, he is a goblin, but no needs to be alarmed, he is a friendlies goblin". The rest of the gang remained huddled up in the corner of the room wondering if the goblin had managed to use his goblin powers to brainwash Babo into believing he was nice, just to get inside the room and then devour the whole gang one by one. Their fear was short-lived though when Gordon spoke to them, "Please don't be afraid, I'm just a lonely little green goblin who would like to make friends with you all, and your good buddy Babo here already explained to me that you all like cookies too, so the fact that cookies are my favourite food I think we'll all get along perfectly". 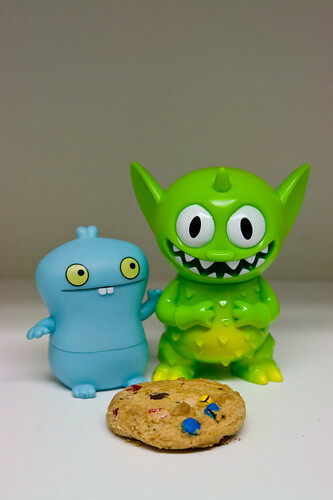 Babo showed Gordon into the kitchen where a cookie lay waiting, and with a gentle tap on Gordon's arm Babo explained, "You is our guests now Gordon, so we must supplies you with tasty cookies, enjoys this one to begins with! ".